The building with the red roof shows the former Willow Grove Naval Air Station Fire Department's proximity to homes across Route 611. Perfluorinated chemicals in firefighting foam used for decades at the Navy facility in Horsham Township is contaminating drinking water. A federal appeals court on Tuesday ruled two Bux-Mont families may continue their legal efforts to require the U.S. Department of Navy to cover the costs of medical monitoring because their drinking water is contaminated. In a precedent-setting case, the U.S. Court of Appeals for the Third Circuit in Philadelphia overturned part of a U.S. District Court decision, reviving the families' claim that the Navy fund a trust to cover a private party medical monitoring program to help them properly assess and respond to any health consequences. The lawsuit, brought by the Giovanni and Palmer families, who live near the former Willow Grove Naval Air Station and Air Reserve Station in Horsham, Montgomery County, and the former Naval Air Warfare Center in Warminster, Bucks County, had sought medical monitoring, a health assessment, a health effects study and blood testing out of a concern that chemicals from those facilities had contaminated their drinking water and placed them at a higher risk of developing illness. The military facilities used a firefighting foam with perfluorochemical compounds, or PFAS, that were also widely used at one time in a variety of applications, including non-stick cookware, stain-resistant clothing and fabrics and food packaging. These chemicals are persistent in the environment and the human body as they don't break down and can accumulate over time. They can travel long distances, move through soil, seep into groundwater, or be carried through air, according to the Agency for Toxic Chemicals and Disease Registry (ATCDR). There is evidence that exposure to PFAS can lead to adverse human health effects, according to the EPA. According to ATCDR, some studies of exposure in humans have shown that certain PFAS may affect growth, learning and behavior of infants and older children; lower a woman’s chance of getting pregnant; increase the risk of cancer; interfere with the body’s natural hormones; increase cholesterol levels; and affect the immune system. The Horsham and Warminster facilities improperly disposed of contaminants and hazardous substances, allowing them to enter the groundwater supply. Both have been listed on the EPA's National Priorities List, also known as Superfund, for more than two decades, meaning there is a clean-up action ongoing under the Comprehensive Environmental Response, Compensation, and Liability Act (“CERCLA”). In July 2017, U.S. District Judge Gerald J. Pappert granted a Navy motion to dismiss the families' lawsuit, agreeing the court lacked jurisdiction to hear the claim because it represented a "challenge" to those ongoing environment cleanup efforts. The families filed an appeal, which was heard in April. On Tuesday, the U.S. Court of Appeals for the Third Circuit agreed with Pappert that a health assessment or health effects study is barred because it challenges those continuing cleanup efforts. But the court concluded that medical monitoring does not represent a challenge under CERCLA, or interfere with cleanup efforts, and that it is not barred by sovereign immunity. The case was remanded to U.S. District Court for that claim to be heard. The view along Kirk Road, looking toward Jacksonville Road, in Warminster. 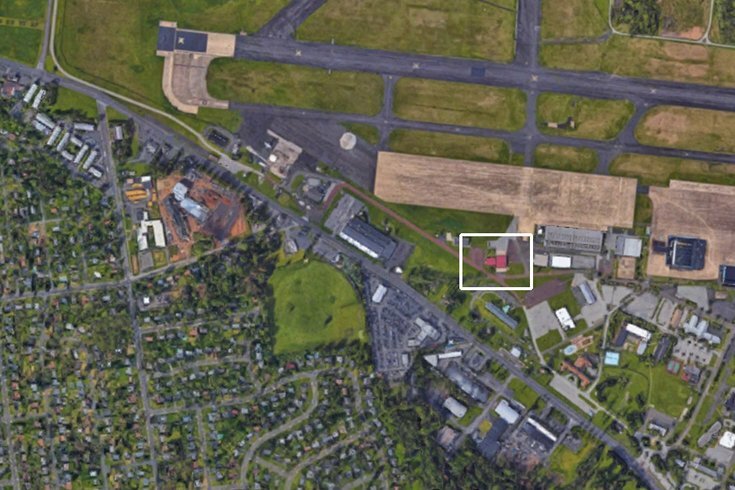 At left, beyond the fence, is the area where fire training exercises using PFOS-containing firefighting foam took place at the former Naval Air Warfare Center. 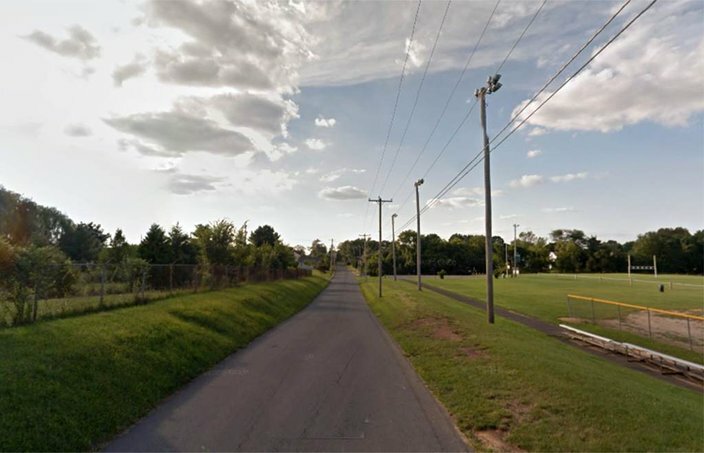 At right is Werner Field, home of the Warminster Pioneers youth football teams. Kristen and Charles Giovanni and their three children have lived across the street from the Willow Grove facility for 15 years. According to the lawsuit, the water from their private well, which they had used since December 2003, had a combined PFOA/PFOS level of 2.88 µg/L, well above the EPA's non-binding provisional health advisory of 70 parts per trillion 0.07 µg/L. The Navy provided the Giovannis with bottled water for several months before it connected them to the Warrington Township public water supply, which is also contaminated with PFCs, according to the lawsuit. Dorothy Palmer, along with her son George Palmer, has lived less than one mile from the Warminster facility since 1981. For years, they used a private well on their property, until they learned about the PFOA and PFOS contamination in the groundwater. Their private well water had a combined PFOA/PFOS level of 0.62 µg/L. Like the Giovannis, the Palmers were provided with bottled water until it connected them to the Warminster Municipal Authority’s public water supply. Subsequent testing of that supply has revealed PFC contamination there, too, the lawsuit said. Their appeal was supported by amicus briefs filed the Delaware Riverkeeper Network and Maya van Rossum; the Toxics Action Center; and a number of residents who currently live or formerly lived near the facilities, including U.S. Rep. Brendan Boyle. The plaintiffs were represented by Mark R. Cuker, of Cuker Law in Center City Philadelphia.